Soulra are a leading creator of high performance and environmentally friendly products. 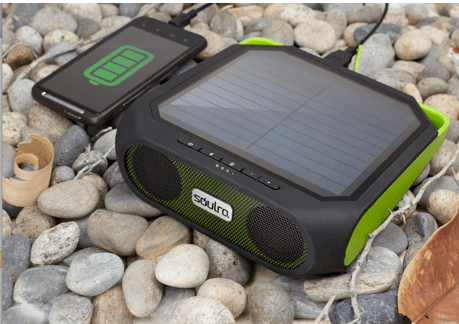 They have just announced the Rugged rukus, which is a portable Bluetooth wireless, solar powered sound system, featuring a durable IPX4 certified splash proof design. This makes it an essential part of your outdoor kit. While it has the ability to play music, it can also keep your smartphone or tablet charged thanks to solar power while it plays music. The design is lightweight and compact, and it can fit in most rucksacks. It has also been designed as an all terrain speaker, so that it can be tough, with no loss of sound quality. An aesthetically pleasing design and striking colour palette are also part of the package. The unit contains a lithium battery that is charged by the 20 inch square solar panel or by means of a USB adapter. Five hours in direct sunlight, or 2.5 hours of charge from a plug in charger can give you more than 8 hours of tunes, which makes it perfect for those days out on the beach, in the park, or just for walking trips and camping. The Rugged rukus is available for £89.90.